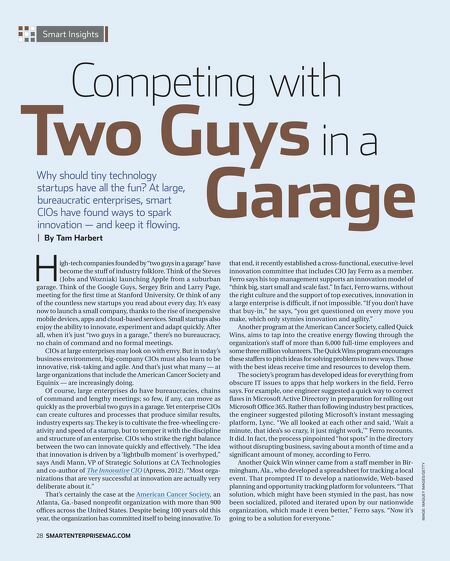 Smart Insights Competing with Two Guys in a | By Tam Harbert H Garage igh-tech companies founded by "two guys in a garage" have become the stuff of industry folklore. 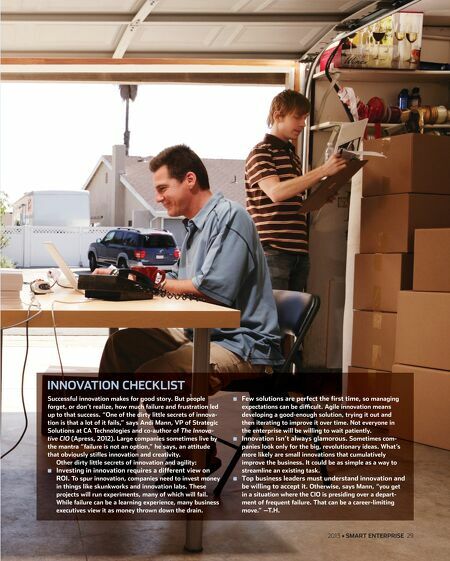 Think of the Steves (Jobs and Wozniak) launching Apple from a suburban garage. Think of the Google Guys, Sergey Brin and Larry Page, meeting for the ﬁrst time at Stanford University. Or think of any of the countless new startups you read about every day. It's easy now to launch a small company, thanks to the rise of inexpensive mobile devices, apps and cloud-based services. Small startups also enjoy the ability to innovate, experiment and adapt quickly. After all, when it's just "two guys in a garage," there's no bureaucracy, no chain of command and no formal meetings. CIOs at large enterprises may look on with envy. But in today's business environment, big-company CIOs must also learn to be innovative, risk-taking and agile. And that's just what many — at large organizations that include the American Cancer Society and Equinix — are increasingly doing. Of course, large enterprises do have bureaucracies, chains of command and lengthy meetings; so few, if any, can move as quickly as the proverbial two guys in a garage. Yet enterprise CIOs can create cultures and processes that produce similar results, industry experts say. The key is to cultivate the free-wheeling creativity and speed of a startup, but to temper it with the discipline and structure of an enterprise. CIOs who strike the right balance between the two can innovate quickly and effectively. "The idea that innovation is driven by a 'lightbulb moment' is overhyped," says Andi Mann, VP of Strategic Solutions at CA Technologies and co-author of The Innovative CIO (Apress, 2012). "Most organizations that are very successful at innovation are actually very deliberate about it." That's certainly the case at the American Cancer Society, an Atlanta, Ga.-based nonproﬁt organization with more than 900 ofﬁces across the United States. Despite being 100 years old this year, the organization has committed itself to being innovative. To 28 SMARTENTERPRISEMAG.COM that end, it recently established a cross-functional, executive-level innovation committee that includes CIO Jay Ferro as a member. Ferro says his top management supports an innovation model of "think big, start small and scale fast." In fact, Ferro warns, without the right culture and the support of top executives, innovation in a large enterprise is difﬁcult, if not impossible. "If you don't have that buy-in," he says, "you get questioned on every move you make, which only stymies innovation and agility." Another program at the American Cancer Society, called Quick Wins, aims to tap into the creative energy ﬂowing through the organization's staff of more than 6,000 full-time employees and some three million volunteers. The Quick Wins program encourages these staffers to pitch ideas for solving problems in new ways. Those with the best ideas receive time and resources to develop them. The society's program has developed ideas for everything from obscure IT issues to apps that help workers in the ﬁeld, Ferro says. For example, one engineer suggested a quick way to correct ﬂaws in Microsoft Active Directory in preparation for rolling out Microsoft Ofﬁce 365. Rather than following industry best practices, the engineer suggested piloting Microsoft's instant messaging platform, Lync. "We all looked at each other and said, 'Wait a minute, that idea's so crazy, it just might work,'" Ferro recounts. It did. In fact, the process pinpointed "hot spots" in the directory without disrupting business, saving about a month of time and a signiﬁcant amount of money, according to Ferro. Another Quick Win winner came from a staff member in Birmingham, Ala., who developed a spreadsheet for tracking a local event. That prompted IT to develop a nationwide, Web-based planning and opportunity tracking platform for volunteers. "That solution, which might have been stymied in the past, has now been socialized, piloted and iterated upon by our nationwide organization, which made it even better," Ferro says. "Now it's going to be a solution for everyone." IMAGE: MAGUEY IMAGES/GETTY Why should tiny technology startups have all the fun? At large, bureaucratic enterprises, smart CIOs have found ways to spark innovation — and keep it flowing.